Hooray, it’s a summer holiday weekend!!! There will be all types of gatherings over the next few days, and this salad will fit right in. It really packs a flavor punch, the best part is, you can make a lot on the cheap. As the saying goes, cool as a cucumber. During the summer cook out season, the onslaught of pasta, macaroni, and potato salads begins, this one stands apart, and no mayonnaise to get rancid. It is tangy, crunchy, and light, perfect if you are watching carbs, and almost effortless to make. For best results use a bowl that the cucumbers and onions will be, for the most part submerged in, which allows all the tangy goodness to happen. It is best to make a day in advance, or let the salad sit overnight, that said I have made this on a few hours notice, with great results. 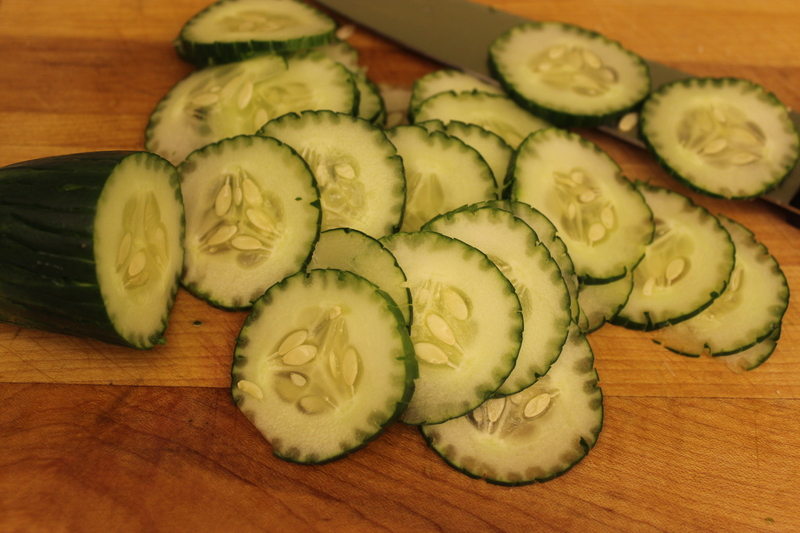 Try to find cucumbers that are fairly narrow, the fatter they are, the more seeds they will contain. I always tine the cucumber, simply run a fork down the cucumber, repeating all the way around. 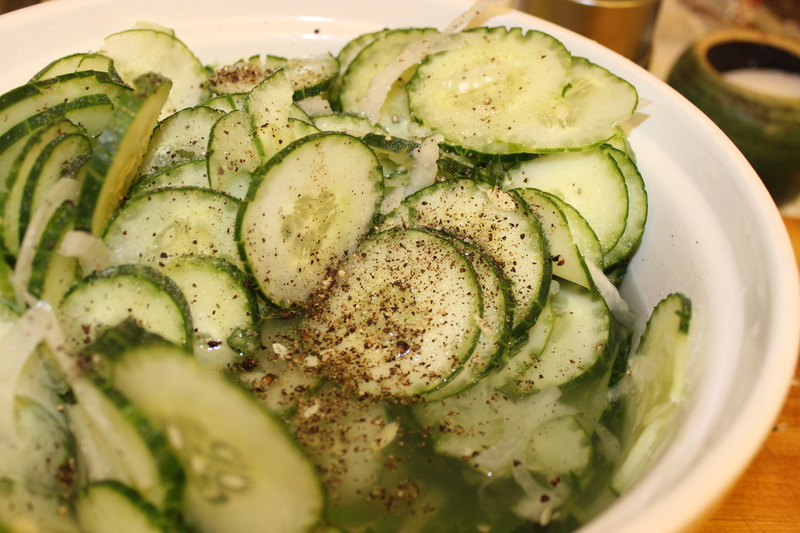 This creates a great visual appeal, and adds more great cucumber flavor to the brine as well. I made this just the other night for a 4th of July potluck lunch at work, it was a big hit. I was feeling rather good, (or should I say smug) about coming up with a dish, that is so quick, and easy to prepare. I stopped at the grocery after working my part time job, picked up cucumbers and an onion, and headed home. I quickly get started, tine the cucumber, slice it thinly then set to work on the onion. This never happens on TV, but I am certain, it has happened to countless cooks across the world. Sometimes, no matter how careful you are with selecting produce, there is a surprise inside, that you do not want. This does not happen on TV! 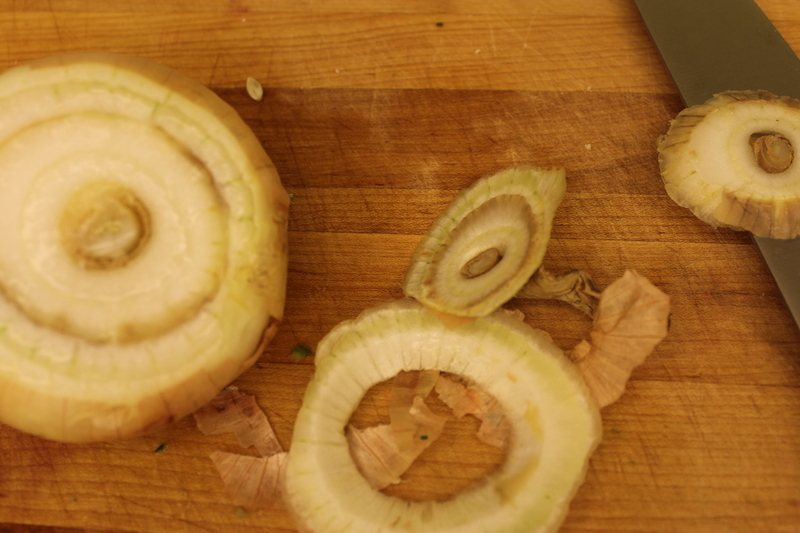 I had no idea what evil lurked inside this onion. This was an unfortunate set of circumstances, it was at least 9:30 pm, I was tired from working both jobs, no way was I going out to the store. On top of that I had eggs cooking on the stove, for the deviled eggs, I also volunteered to bring. Which reminds me, what the heck is with the price of eggs? 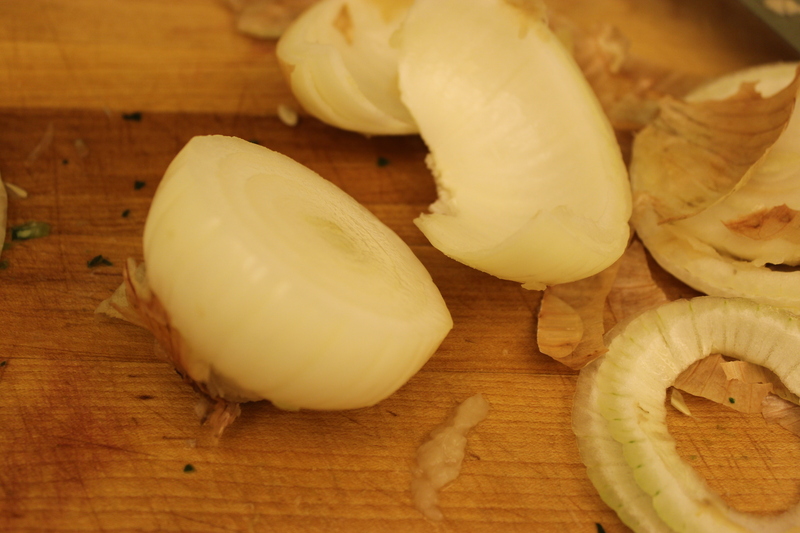 I peeled off the out gross parts, washed the remainder, and luckily had a half of sweet onion in the fridge. 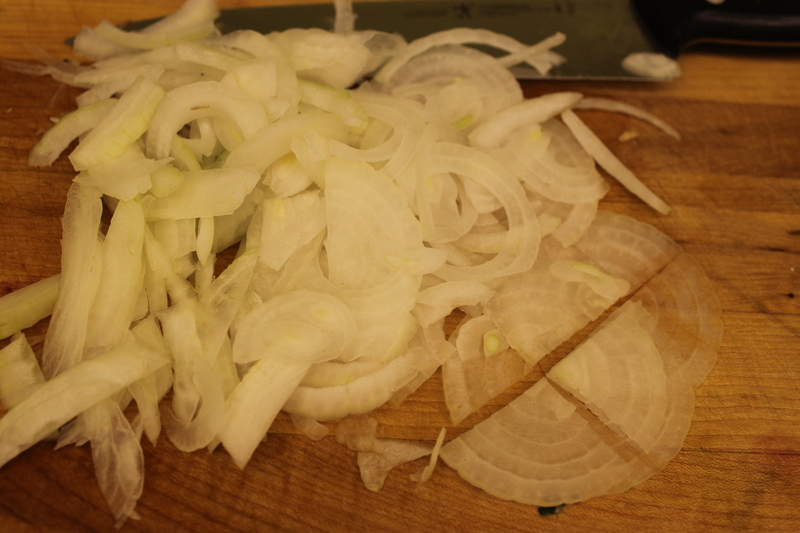 I do have an infinity for onion sandwiches, sweet onions are pretty much a staple in my house. Combine cucumber and onion, toss gently until mixed together, salt and pepper. You can be fairly liberal with the salt and pepper, so do this to your taste. Add vinegar and water to cucumbers, stir to combine. 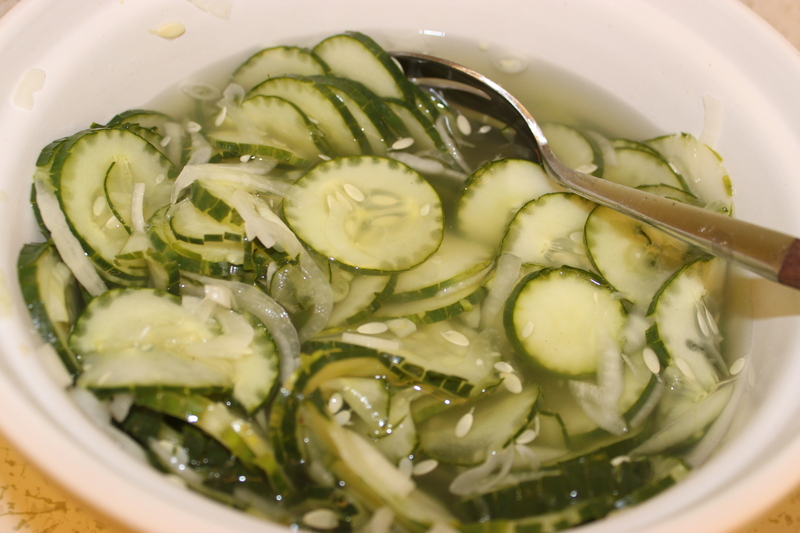 The cucumbers should be as submerged as possible, add more vinegar or water to adapt to the bowl. Refrigerate salad overnight, or for at least a few hours, the longer you allow them to sit, the more tang they will have. Serve with a slotted spoon. It looks wonderful! I like to add a little Tabasco as well in my cucumber salads. 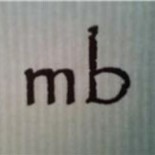 This entry was posted on July 2, 2015 by mb in Holiday, Salad, Sides, Vegetables and tagged food, holiday, recipes, salad, Sides, vegetables.